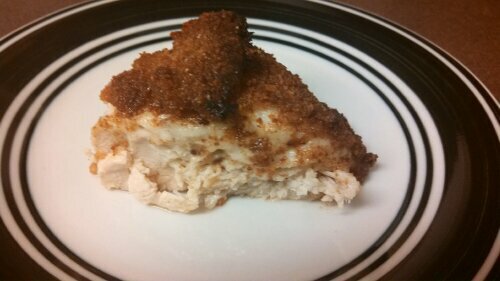 The top “crust,” was alright – baked-on mayo and parmesan cheese with a bread crumb dusting. Maybe the recipe needs more parmesan cheese? Maybe I added too many bread crumbs? I don’t know. But it just did not do it for me. I don’t want to sound mean, though. Clearly a lot of people really enjoy it, if it is featured on a brand-name website, as well as other food blogger’s websites, so if you make this and find it delightful, please let me know what I did differently!! -Meanwhile, combine mayo and parmesan cheese in a bowl. -Arrange chicken on a baking sheet and evenly top with the mayo mixture, then sprinkle on the bread crumbs. -Bake until cooked thoroughly, about 20-25 minutes.